The original Chocolate Pudding Cake recipe, given to me by a dear friend, used a chocolate cake mix. Well that appealed to me, a lazy (or was it insecurity?) baker. It became almost the only dessert I could rely on to turn out well, and well, who doesn't like chocolate cake? But I discovered there is a purist hiding deep within me, and I re-worked the recipe. This version is my go-to reliable-made-from-scratch (almost, if you don't count the pudding) redeemer of the anti-baker I used to be. 1. Preheat oven to 350. 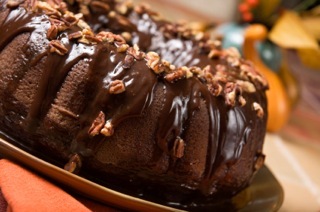 Coat two cake pans or one bundt pan with margarine or shortening and dust with cocoa. 3. In another large bowl, whisk together remaining ingredients until blended and lump free. 4. Pour dry ingredients all at once into liquid mixture, Whisk until well blended, do not overmix. 5. Pour batter into prepared pan(s). Bake for 25-30 minutes for layer cake and 50-60 for bundt cake, or until top of cake springs back when gently pressed with a finger. Remove from oven, cool for 5 to 10 minutes before turning onto cooling racks. 6. When completely cool, spread with icing. **For the Cake Mix Version of the Chocolate Pudding Cake: Replace cocoa, flour, sugar, baking powder and soda with one chocolate cake mix. Save time, and the results are almost as good.